Communities across the country have been rediscovering historic downtowns as the center of civic life and a source of community and cultural identity. Siloam Springs embodies this movement. Within just the past eight years, over 20 buildings have been renovated, more than 25 businesses have been opened (adding a net of nearly 100 new jobs), and an estimated 11 million dollars has been reinvested in property purchases, building renovation, and public improvement projects. Building upon this momentum and success, the 2014 Siloam Springs Downtown & Connectivity Master Plan was launched. The purpose of this plan is to continue preservation and improvements in downtown’s built environment through infrastructure and facility planning, to ultimately realize a more vibrant urban core. A particular focus is placed on opportunities to leverage and enhance public assets such as Siloam Spring’s park spaces, Sager Creek, the off-road trail system, and the original Spring sites; to create walkable and bikeable downtown streets; and to promote further economic development. In addition, the plan seeks to create better connections between downtowns and its surrounding neighborhoods, John Brown University, and other assets in the city and region. This plan will positively impact the quality of life for all members and visitors of the Siloam Springs community. Click below to read the 5 – 7 year phased implementation plan for improvements to the downtown core. Rome wasn’t built in a day, and restoration doesn’t happen that fast either. 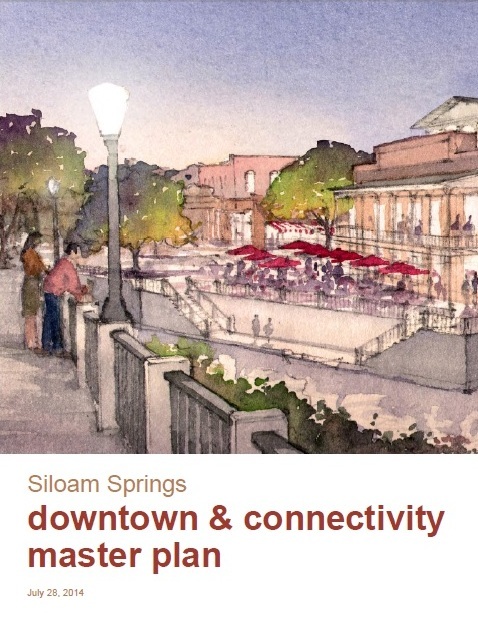 In 2013, Main Street Siloam Springs began to facilitate the creation of a Siloam Springs Downtown & Connectivity Master Plan, with the goal of a completed, published plan by July 2014. Working in collaboration with key community partners, we developed a steering committee and began the process to hire a planning firm. After a rigorous bid and interview process, Dover, Kohl & Partners was selected as the consulting firm. The development of the plan was a 7-month process that involved multiple public meetings, interviews with city officials, business owners, and downtown developers, and extensive studies on transportation, topography, economics, residential life, and more in downtown Siloam Springs. At the end of this process, over 500 voices from the Siloam Springs community were a part of shaping this plan, and it was unanimously approved and adopted by the Siloam Springs City Board of Directors in August of 2014. Funding to complete the Master Plan came from a Walton Family Foundation grant, a $35,000 matching portion from the City of Siloam Springs, and other donations by the Siloam Springs Chamber of Commerce, Bridges to Wellness, John Brown University, Simmons Foods, and the Siloam Springs Regional Hospital. Additional letters of support came from the Siloam Springs School District, Arvest Siloam Springs, and Cobb.